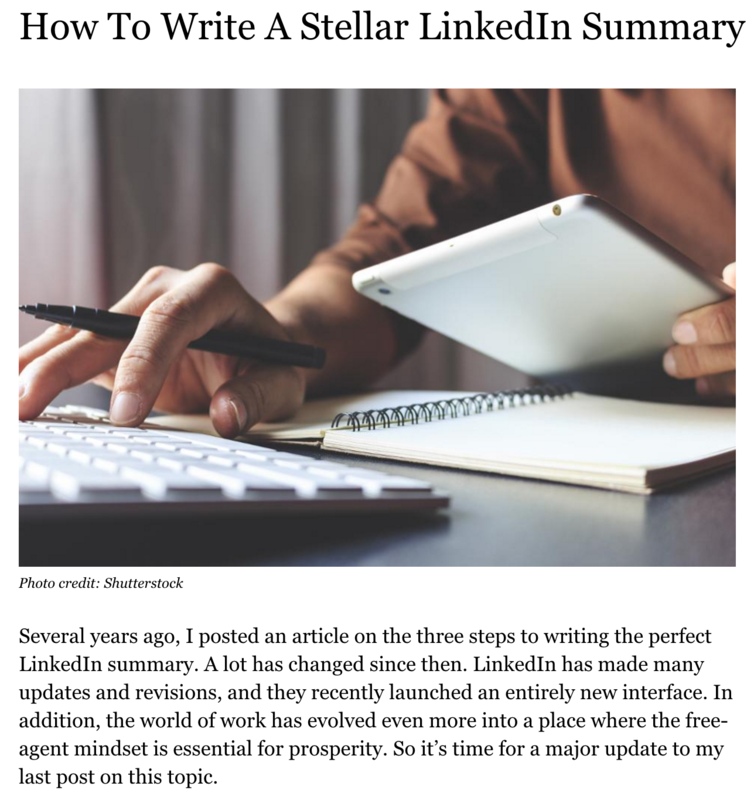 Several years ago, I, William Arruda, published an article on the three steps to writing the perfect LinkedIn summary. A great deal has changed since the publishing of the article. LinkedIn has made many updates and revisions including a recently launched entirely new interface. In addition, the world of work has further evolved into a place where the free-agent mindset is essential for prosperity; therefore, it is time for a major update to my last article relating to the LinkedIn summary. LinkedIn is often the first place people go when they are looking to evaluate you in a professional capacity. If people Google your name to learn about you, your LinkedIn profile is likely to show up in one of the top spots in the search results. 62% of Google clicks go to the top three search results, those who start at Google will end up at LinkedIn. For many of us, a LinkedIn profile is the most comprehensive bio we have on the web. Your LinkedIn summary (all 2,000 or fewer characters) will likely be read by more people than any other version of your bio. 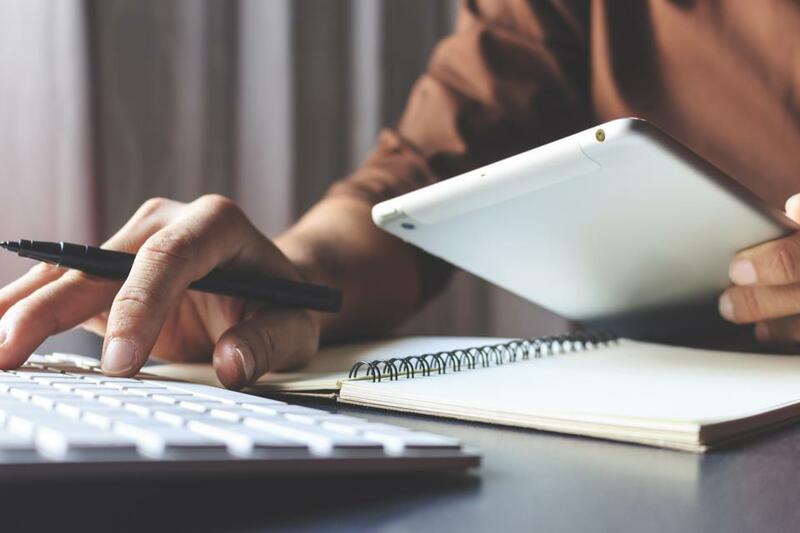 This added exposure gives you a great opportunity to capture the attention of decision-makers but only if you have a summary that connects. It shows relevance. It attracts the right people who are important to your career success, informing people about yourself enabling them to determine if you are relevant to their goals. It differentiates you from your peers. With vast amounts of people delivering the same services as you, standing out is essential. It makes people want to discover more about you and ultimately connect with you on a one-on-one basis. Of course, this means congruence with the real-world you is critical. I have had the opportunity to help thousands of professionals tell their story in the form of a LinkedIn summary and what I share here is the proven process we use. It is a simple system which makes your summary sing. Who is your ideal audience — the people you want to reach? Who are the most important decision makers and influencers in your world? What do you want them to know, learn, or do? Document your responses to these questions so you can start gathering your raw materials. Speaking out loud will only help your ability to set the scene; some people may stare at you if you attempt this in Starbucks. Write a couple of sentences about what you do in terms of the value it creates for your team, your company, and internal or external clients. I call these the VPs of the brand you. What are your non-negotiables — your operating principles? And what brings you energy and joy? For example, collaboration, harmony, travel and tennis. Describe the things you do better than anyone else. List things you can quantify – and don’t restrict yourself to just those that are work-related. Cull the things that make you-you and help you stand out from your peers. Include all those things that help you reinforce what you say about yourself. They include the awards and accolades bestowed upon you for example, “Graduated with honours from the University of Massachusetts; was awarded an innovation fellowship by the Association of Advanced Technology” and testimonials or recommendations from mentors or senior leaders. Is there anything extraneous (not essential to expressing your brand message)? Is it authentic and aspirational (connected to who you really are while positioning you for where you want to go next)? Those were the words of wisdom shared with me by the prolific and successful author Ann Handley when I interviewed her for my podcast. Ann reminded me that we put a lot of pressure on ourselves when we are writing, and if you lower your expectations of your first attempt, you can typically refine, edit, or recreate something that is really quite good. Sometimes the less-than-stellar prose we write becomes the inspiration for the perfect sentence or paragraph. Everyone knows you wrote your own LinkedIn summary, so writing about yourself in the third person seems a bit disingenuous. Writing in the first person creates a conversation between the author and the reader which is the best way to build a relationship. The first person version of your bio sounds more like storytelling and less like listing your accomplishments — and your summary is all about storytelling. You can use the experience section to tout your accomplishments. Focus on the first two sentences. The latest major update to LinkedIn reduced what people see when they look at your profile to the first two sentences of your summary. That means those two lines are the most important. They will either be good enough to entice the reader to click see more or they will bore everyone into skipping to the next profile. Because the first sentences play such a vital role, you need them to be compelling, provocative or mysterious. Think of them as a teaser for a show or the trailer for a movie. Look at your raw content and choose something that stands out or makes an eye-catching thread that you will be able to weave throughout your summary. Now it is time to fill in the details, integrating the content from the various categories into an authentic and compelling story. The best sentences will likely combine content from different categories. Remember, LinkedIn limits your summary to only 2,000 characters including spaces; make every word count. Use their feedback to refine your summary. You will be ready to upload it to your profile and let the world know who you are! I, MaX Falstein, did not author this post, it is copied from William Arruda's post on Forbes' website. William Arruda is the co-founder of CareerBlast and creator of the LinkedIn quiz that helps you evaluate your profile and networking strategy. I was thoroughly underwhelmed by the standard of writing I felt the urge to correct and republish the article to show both William Arruda and Forbes how I thought the article should be written. The act of republishing is only an opinion I wish to show; however, it can be ignored by William Arruda and Forbes at their discretion. I stake my claim of ownership to the corrections, both grammatical and linguistical. I understand if William Arruda and/or Forbes are minutely embarrassed by the act of republishing; however, I intended to encourage development and not to discourage publishing of important information and opinions in the original article. Making Forbes articles easier on the eyes involves using the developer tools and inspecting elements to remove chunks of the local website. Clean reading function in Ghost browser would be excellent.